Protecting container plants in extreme summer heat is a challenge many gardeners face. Note that the plants in soil bed do not feel that much heat as compared to the ones in containers. In my case, i have got majority of my container plants on my terrace, the floor heats up in summers and the roots of plants at bottom of container are stressed. I had to water every second day to protect them. Last year i lost some of my plants because of that. Here is what i am doing this summer and this is going good so far. Mulch: The best mulch components are leaf mold, coco peat and some organic matter or humus. You can also include, shredded newspapers and card boards. Remember, leaf mold cools the soil more than anything else. 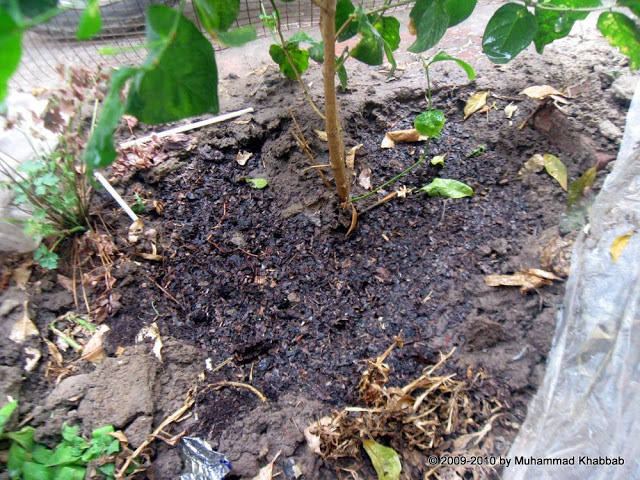 See the following arabian jasmine, though in soil bed, i have mulched it with leaf mold and coco peat around 2 inches depth. This is how it will look closely. Don’t forget to keep the mulch away from the main stem. 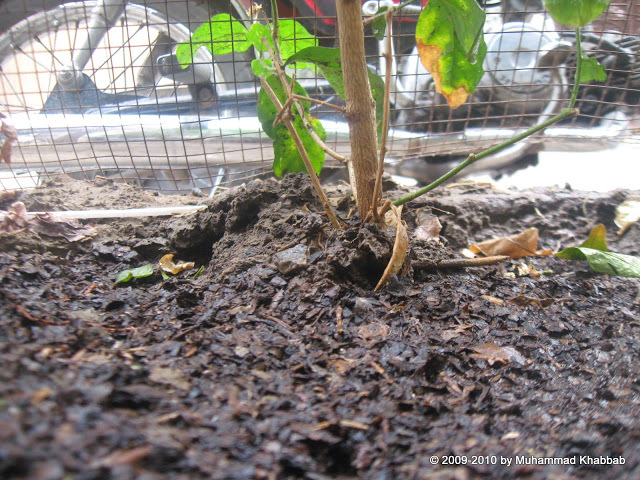 Mulch will protect the plant from outside heat but not the bottom heat which is coming from the floor and stressing the roots. Humidity: If your containers are at your terrace, the bottom heat will stress the roots of the plants. To handle this, place your container in a tray of pebbles soaked in water. But don’t forget, your pot should not be standing in water, just the pebbles should be soaked and not the lower portion of your container. It is also useful for those plants which like humidity e.g. Arabian Jasmine etc. 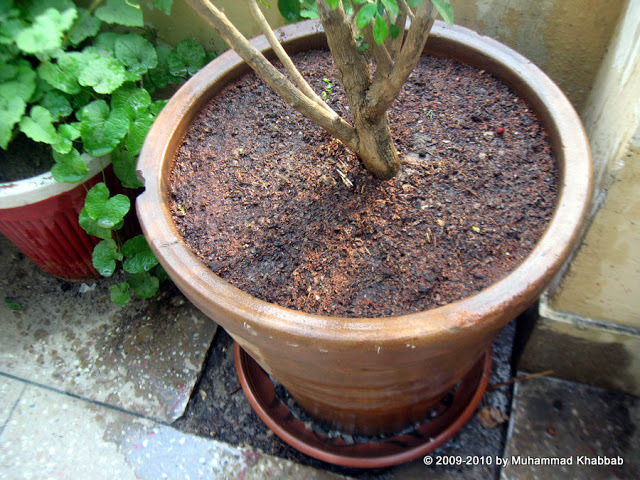 Type of container: If you see below, this is my murraya exotica plant in an 18 inches clay pots. If you use terracotta pots, the terracotta color will protect the plants from heat however plastic pots heat up in direct sun. I like clay pots and they provide better protection from heat as well. The mulch of leaf mold and coco peat is 2 inches deep. And last but not least container gardeners should try to plant drought tolerant plants as much as possible. The plants which are native to south africa, brazil, australia and mexico are very suitable to our sub tropical hot climate. The temperature outside temperature on my terrace right now is 110F which is quite challenging. But the mulch and pebbles tray are doing a great job till now. Super wonderful post..always insightful and super wise..great info! yay! and woah..mega beautiful butterfly in the other post as well..dazzling beauty! Have a happy shiny day! Now I know why all the plants on my Super hot deck don’t thrive…you mentioned the heating of the roots. I will try this remedy of pebbles. It is worth a try because it is so much wasted space otherwise. Thanks for all the tips. 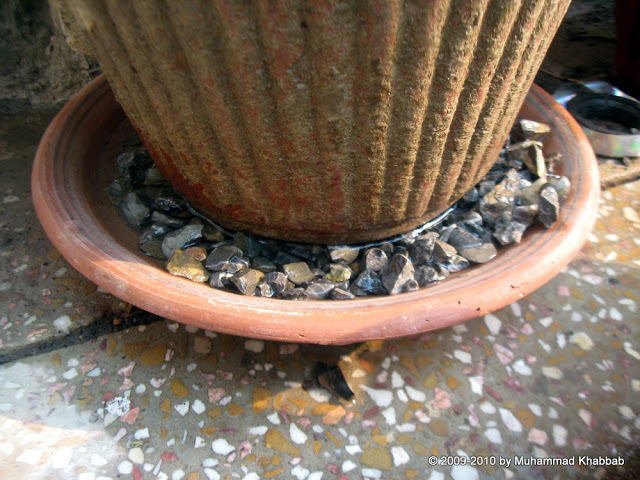 thats a great idea with the stones at the base of the pot. Even in our Scottish summer the plants in pots on the patio still get stressed so I might try this out if I can get some big saucers. What great tips! We rarely have times that it gets that hot here, so it’s always hard to imagine having to deal with those issues. I really like how the rocks for humidity look. Great informative blog … spot on with your suggestions! I’ve been container gardening for many years here in my tropical spot and do exactly the same things. 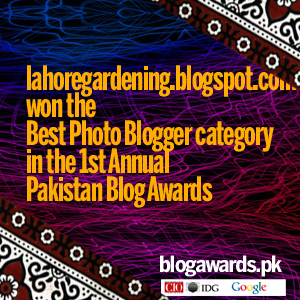 Thanks for popping by to visit my donwunder blog – My Dry Tropics Garden. We certainly do have a lot in common with the climate and conditions, as well as the plants.